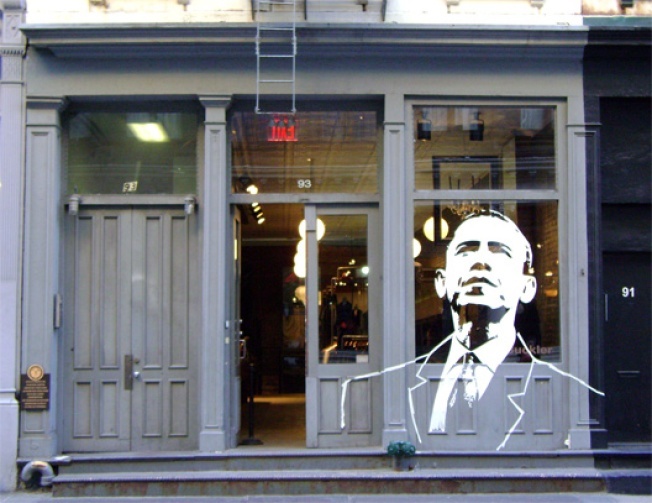 Applying street art tactics and what appears to be a hefty amount of white tape and vinyl, Buckler's Soho store at 93 Grand Street has taken candidate endorsement to another level. We've seen other retailer windows shyly rooting for a single candidate (we're talking about you, Marc) and a slew of nonconfrontational, bipartisan windows, but Buckler's display takes the cake in the balls department. At least it's paying off in recognition; when we stopped for this shot, at least three other random people did as well. Did they go in and buy anything? No, but that's not the point. Designer Andrew Buckler is actually British, so this would be his way of casting a vote.